Look beyond the standard email app to get more power features like converting messages into To Do tasks or calendar appointments. AppleInsider checks out the reasons to leave Apple Mail —and the reasons to stay. We don't come to bury Apple Mail —but we do come to praise its alternatives. 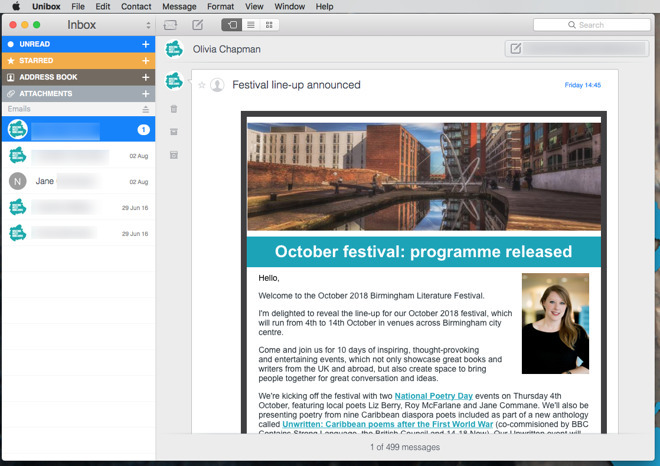 While the free email app that comes on every Mac is grossly under appreciated, there are features it lacks. There are people it doesn't suit, either, and that can be both because of how it looks and the way it works. There are alternatives, however, and that is excellent. If you listen to any developer of any of these rival offerings though, they will say the same things. Obviously they'll hype up their differences or improvements over Apple Mail and clearly they'll also at least gently rubbish that macOS staple. They'd never get you to even look at their apps if they didn't do both of these. One more thing they tend to try, though, is to make you think that you should jump ship completely. Each one is claimed to be a total replacement for Apple Mail and they certainly can be. They just don't have to. You can and we're going to end up recommending that you use two email apps. One of them is Apple Mail. What the other is depends on how you use email, how much you get of it and just a little bit on how your brain happens to work. Just as we aren't going to analyse your head, we're also not going to catalog every possible email app available. What we can do, though, is pick out types of email that suits types of people. We're talking here specifically about the Apple Mail app or what's called an email client. We're also talking specifically about the Mac version as iOS is a very different subject. What we're not talking about, though is the email service that you use. Apple Mail is also a service: is the system by which you get your @icloud.com address and by which you send and receive emails. There are many email services with the main ones being Apple's iCloud, Microsoft Exchange or Google Mail. 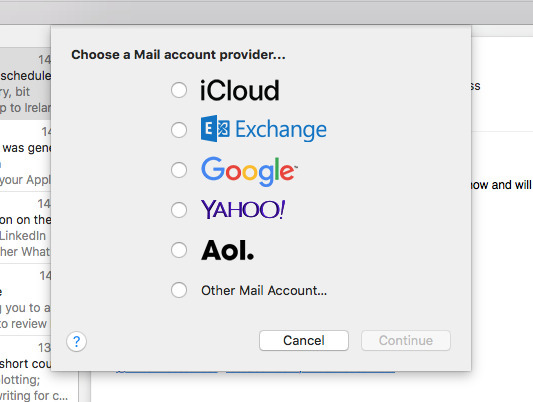 The Apple Mail app will work with just about any email service provider you can find. So here we're focusing on what that app can do and what it can't —or what is done better by alternatives. We're focusing on who these rival apps are best for. Really if you just get a few emails a day then apart from envying you, we also recommend that you stick with Apple Mail. That's especially true if you then don't tend to do much with those emails: if you just have to read them and not particularly act on them. You could use any of the email apps we mention and a dozen more to do this but you wouldn't see any advantage. You might, too, see disadvantages as some of the more powerful apps are complex and unnecessarily so for basic use. If you get 30 emails an hour, you're not going to be able to stay on top of them. Even if your full-time job was manning an email support service, you'd struggle so you need to look at email triage. By default, Apple Mail will show you the sender's name, the subject and in theory the first few words of the message. In practice, senders can now change that preview to instead show you any text they like. Consequently email newsletters promoting an event might choose to put its venue and date in there. Bless them. Anything that means you can look at a message once and immediately see whether you have to do anything about it is a great thing. Apple Mail also lets you specify that you only want to be interrupted by certain people. It lets you say that you want to hear a bleep when your boss or your client emails but otherwise you get left alone until you're ready to dive into your inbox. You do that by marking an individual as a VIP. That's an excellent system for how swiftly you can do it. The sender's name in any email you get is a dropdown menu and that contains the option to Add to VIPs. However, it's no use at all unless you know the specific email address of this most important person. Maybe they use several different ones and you'll have to separately mark each one as a VIP. Or more likely, you need to react quickly to emails that come from anyone working at that client. Apple Mail's VIP system can't help you there: you have to start looking into Mail rules. The Mac version of Apple Mail has powerful rules or instructions you can give it for how to deal with various messages but there is a problem. You have to leave Apple Mail running all the time and on a Mac that is switched on all the time. Whereas Google's Gmail is replete with powerful options for rules —or what it instead calls filters —and they run before mail even reaches your Mac. That sounds ideal and it is something we wish Apple would add to its email app but it too comes with a problem. 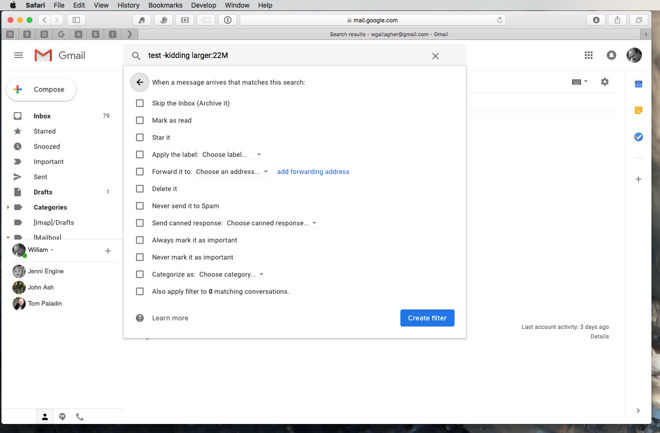 To get this kind of functionality you have to switch email services: instead of using Apple's iCloud Mail, you have to get a Google Gmail account. Just to make this as complicated as possible, you can use the Apple Mail app to read and write emails with your Gmail account. However, Apple Mail isn't great at it and there is no official Gmail app for Mac. If you'd be happy just using Gmail online in your browser, though, its filters or rules are tempting. 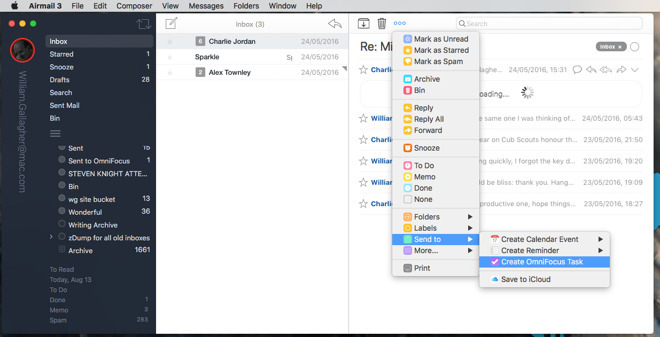 There is a Mac desktop app for Microsoft Outlook and that too needs you to move over to using a different email service. This time it's Microsoft Exchange and that sorts emails before you get them. It tends to make a guess as to what emails matter to you and which don't, so it's automatically sorting the important ones into a priority inbox within Outlook. It's hard to give up control over your inbox and let an app make decisions on what you want to read, but Outlook is good and gets better the more you use it. Gmail is free to use and Outlook is provided as part of Microsoft Office 365 from $99.99 per year. The busier you are, the more it's likely that you need to actually do things based on the email messages you get. You have to take action that's a bit more involved than just replying. This is where Apple Mail hurts us the most. We've got Macs running all day so we can have rules set up to deal with things but what we can't easily do is act on messages. It would be great, for instance, if you got a message that you could just pop straight into your To Do list with a click or a swipe. Apple Mail can't do that but Unibox goes for speed by assuming you're initially more interested in who's emailed you than what they've said. No question, if your partner emails and so does a supplier you used a year ago then one of these is going to be urgent and the other probably isn't. So Unibox displays a list the senders. You have to click on them to see even what the subject heading is. The result is that the app is slightly more minimalist than Apple Mail and it does appear to be right about our interest. At least, it turns out that a huge number of emails we get we know we can ignore just because the sender is a newsletter whose list we've never been able to get off. Unibox also has a button for quickly emailing a person. Only, it appears when you've had an email from them. You'd have to be pretty organized to choose to write them a new email instead of just clicking Reply but perhaps you are. 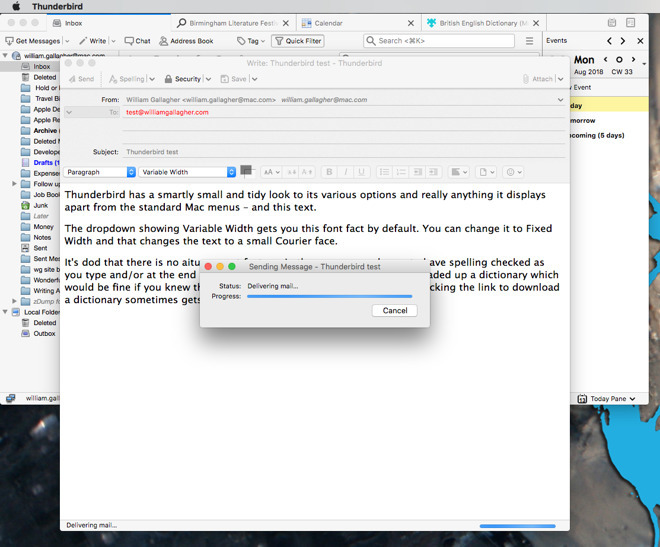 Unibox costs $13.99 on the Mac App Store and is also available as part of Setapp. Most email apps are aimed at particular types of people. Airmail 3 is for ones who are working and need to actively do things with their email, for instance. Thunderbird feels like it goes further, though. It's very definitely for technical people. It presents nearly everything in a barebones, stripped-back look that somehow seems minimal even though it is packed with features and buttons. This is the email app for you if you're ever fussed about seeing the behind-the-scenes source code for an email. It's for seeing as many emails at once as possible. It's just not as user-friendly as others: it isn't as thought-through. For instance, if you start to forward a message to someone and then change your mind, there isn't a Cancel button. There's only a Delete one and you have to realise that it deletes your unsent email, not the original. Or because it's meant for more technical people, you do get the odd moment when you're left wondering "yes, and?" at some dialog box. The spell check one, for instance, can be set to pop up when you hit Send but unless you've got a dictionary installed, it just sits there waiting for you to figure out how to dismiss it. It's not so bad if you do have a dictionary installed but first you have to realise that you need one and then you have to get it. Sometimes when we would go to install a dictionary we'd just get an error. Thunderbird is free to use. Another reason for leaving Apple Mail is that it goes wrong. You will sometimes find messages you archived off popping back into your inbox. Occasionally you'll get error messages that are sufficiently cryptic that you just say OK and carry on. That's especially so when you get the message but Apple Mail appears to have done what you wanted. It's frustrating and it's distracting but unfortunately it's also typical of all email apps. There is no one email app we know of that is rock-solid reliable all the time. There is no one email app that is powerful enough to be used by everybody. Although, if there were one such app, it would be Apple Mail. There are companies that don't make alternatives to Apple Mail, they make add-ons or plug-ins that can be used with it. So Sanebox, for instance, is a service that gives Apple Mail the ability to snooze messages. It's also able to automatically generate reminders for you to chase if someone hasn't replied in a month. That's a subscription service which claims to work with all email apps and all email services. It costs from $7 per month and there is a free 14-day trial. Then there's Mail Act-On which adds keyboard shortcuts for handling your mail faster. It gives you rules for sending mails, too, such as delaying delivery or automatically adding CC recipients. It costs from $30 and there's a 30-day trial. 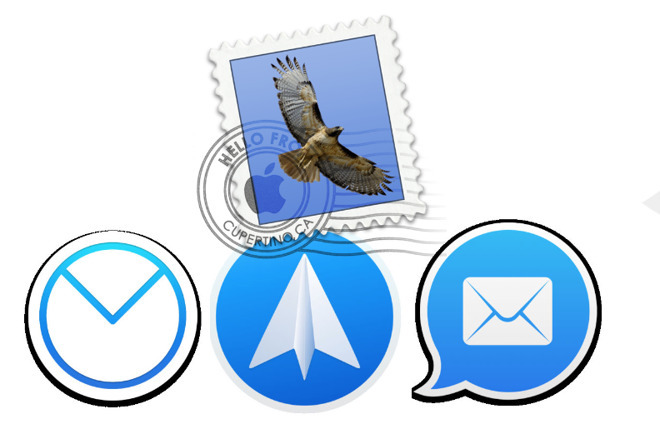 These are both additions that can make Apple Mail itself better.